Now filling Data in Web Pages or Web Forms is really easy to do. 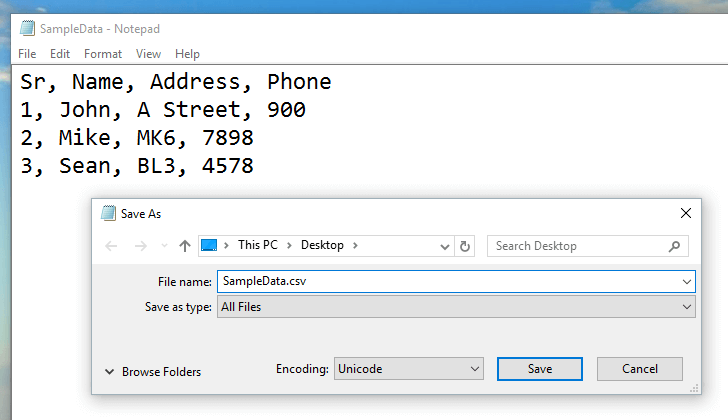 Text Data from .csv Files or from .txt files can now be typed onto active application window. 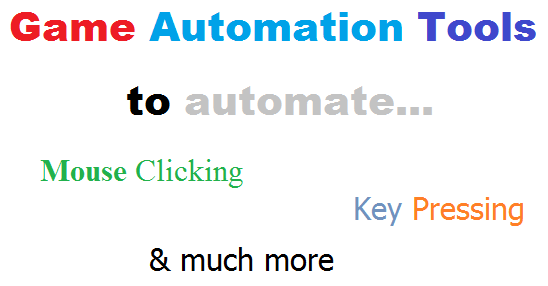 Automating Filling of Online Web Form is done by the software presented here with the help of Keyboard Automation. Yes all you need to do is create a simple script and let the Software Type Data in Online Web Forms and submit it as a Human would do. The Type data from File Action can read Unicode .txt or .csv files. When Filling Forms using .txt Files, this Windows Automation Software reads the Text File, Line by Line and types onto Active Application Window. On the other hand .csv files are specially designed Comma Separated Values which allow easy management of Text Data in Row and Column Format. With the help of Type Data from File Action in Auto Mouse Click Application, you can create a script to read CSV File on a Column by Column basis from .csv file and Fill Online Web Form easily. The .CSV Files are text files and can be opened with the help of Microsoft Excel, Notepad or any other Text Editor Application. The above Screenshot displays a Unicode CSV File which contains 3 Rows of Data and 1 Header Column. This Windows Automation Software reads all rows and header column as well for automated typing. In case your Data to be filled is in a File on a Line by Line basis, you can instruct the software to read from Unicode .txt File. Unicode Files have been implemented for Automated Form Filling as they can contain Non-English Characters as well. Game Automation is widely used by Game Testers and Game Players for varied purposes. This post talks about few Application which can be used to Automate Game Play. Whether you want to Automate an Android Game, a Game running on Windows, Macintosh or on Linux, this post provides information on cheap and free to try applications to Automate almost everything in Games. When Playing a Game, a Gamer might require to Automate a Repetitive Action or Task, on the other hand a Game Tester might need to stress test features offered by a Game. 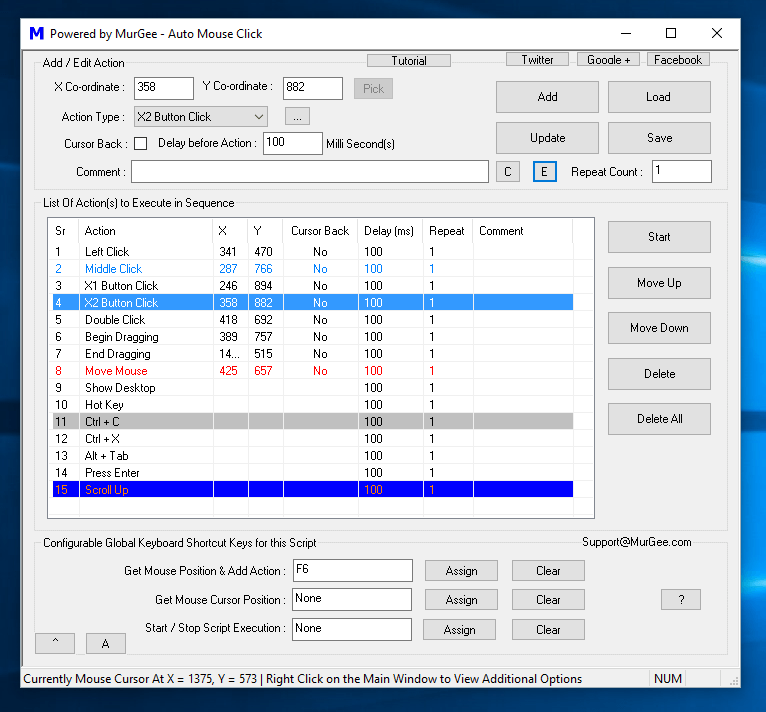 In case you are using Windows, you can read Auto Clicker for Games to know about a few Windows based Applications which can Automate Games with the help of Automated Mouse Clicking, Key Pressing, etc. Once you can Automate a Game on your Windows Computer, you can Automate any Game with the help of Virtualization Software to Automate your Game on other Operating Systems like Macintosh, Linux and different versions of Windows. When Automating Games for any purpose, we often used Desktop Computers running Windows, Macintosh or Linux and the Game Automation Tools are designed to work on Desktop or Laptop Computers with which you can Automate MMORPG Games, Flash based Games or even HTML 5 Games. In order to Automate Games running on Mobiles, you can use Operating System Virtualization Software Application like VirtualBox, Android Emulators like Droid4X, GenyMotion, Andyroid, Windroy, Bluestacks, etc. The post Mac Automation Software covers a Mac OS X Application which can be used for Game Automation on Macintosh and other Operating Systems with Virtualization Software like VirtualBox. Game Automation on Mobile Operating Systems like Android, Windows Phone or iOS requires little bit of extra effort. Various Automation Software Applications or Frameworks are available which require Source Code of the Game to be present in order to create and run Test cases to Automate Games. In case you do not have source code of the Game you wish to Automate, you can use any of the above mentioned Software Applications on your Windows or Macintosh Computer, an appropriate Emulator and Automate your Game. The Auto Clicker for Android post provides a way in which you can Automate Game of your choice without rooting your Android Phone. By bridging the gape between your Desktop Computer and your Mobile Operating System, you can Automate almost any Game on your Mobile Operating System. Requires No Software Installation so you do not need to worry about having Administrative Rights to install a Software on your Computer. Requires No Device Driver Installation which can be really daunting task. Does not involves a Physical USB Device incurring Shipping Charges and Time Delay where you can start right now for Free. 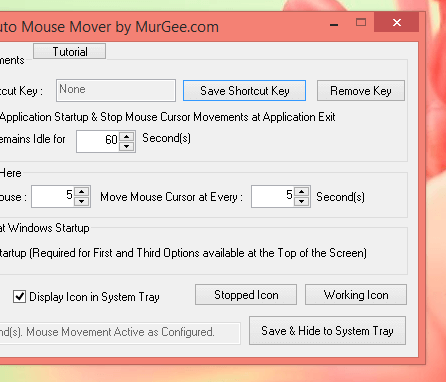 Download the Auto Mouse Mover Software to view and explore the features offered for Free. 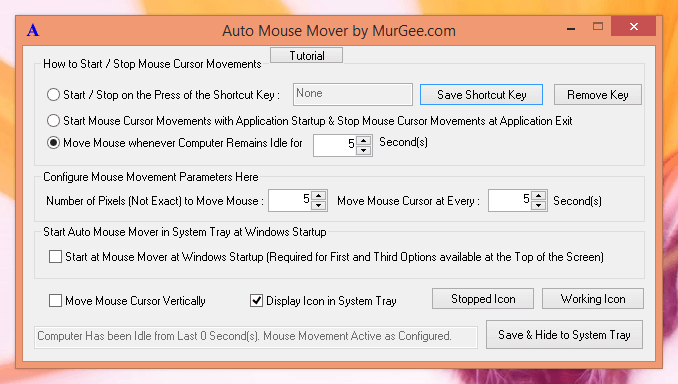 You can even copy this Mouse Mover to USB and configure USB to autorun the Mouse Mover Software. Works on Windows XP, Windows Vista, Windows 7, Windows 8, Windows 8.1 and even on Windows Server Editions. Yes there are lots of features in this nifty application which together lets you keep your Windows Computer Active for as long as you want. 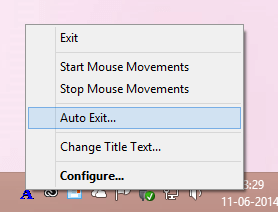 The best part of this Windows Software is that it is totally configurable and comes bundled with all the features you would want from a Mouse Moving Application. Configurable Keyboard Shortcut key to Start / Stop Mouse Movements, Configurable direction of Mouse Movements, Configurable Mouse Move Distance, Configurable Speed of Mouse Movements and lots more make this simple application download really the best. The only benefit of having a Mouse Mover as a USB Device is that there are no licence restrictions. You can use the Mouse Mover USB on as many computers you want. Let’s say you are a technician who frequently work on different computers, then yes a USB Device can be really the choice. However as the above mentioned Auto Mouse Mover is a Free to Download and try Application, using it is equally good enough. On the other hand if you work on your Home Computer or a Dedicated Work Computer, then there is no practical need to spend money on shipping charges and wait for a Mouse Mover USB Device to arrive at your address. You can simply use this software and Keep Windows Active for as long as you want starting right now. Yes you do not need to install any software or device driver and you do not need Admin Access to your Windows Computer as well to use this Software. 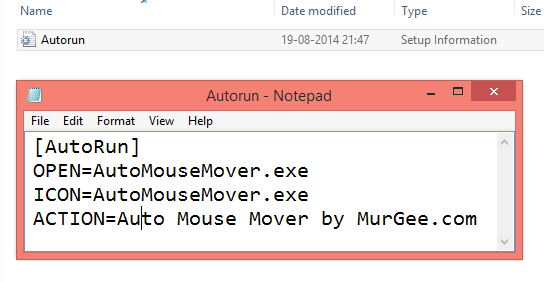 In case you would like to run this Mouse Moving Application from your USB Disk, you would can make your USB Auto Run this Mouse Movements Simulator Application by creating a file named as autorun.inf as displayed in the screenshot above. In case you do intend to use the same USB Drive on Multiple Computers, you can change File Permissions for the Root Disk of USB to be readable and make a folder writable. In this way you can prevent Viruses from spreading with the help of autorun.inf file. You can also create a dummy file big enough on the USB Disk so that there is no space left for other programs and prevent your USB Device from Viruses. Alternatively the best way is to download the Mouse Mover Software from the link mentioned above and use USB Drive for only data transfe. Now you can Prevent your Windows Computer from Locking you Automatically with a tiny Software Application which does not requires Admin Rights and keep Windows Active even when you are not using it. When you use Windows Actively, you basically use Mouse and Keyboard to provide input to your Windows Computer. The Software Application presented here periodically detect whether any Mouse or Keyboard Input has been provided to your Windows Computer or not. Whenever this Software Application detects that your Windows Computer has been left inactive and is not used, it simulates tiny Mouse Movement which effectively keep your Windows PC Active and hence keeps Windows from Locking out Automatically. Logging onto a Windows Computer normally requires you to enter a password or depending on the configured security measures, Logging Back to Windows can be quite tedious. 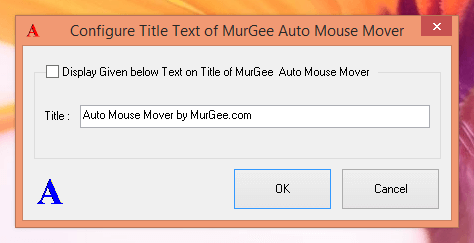 The above Screenshot has been captured on a Windows 8.1 Computer, however you can use this Mouse Moving Software on any other Windows Version including Windows 8, Windows 7, Windows Vista, Windows 2000, and even on Windows XP. 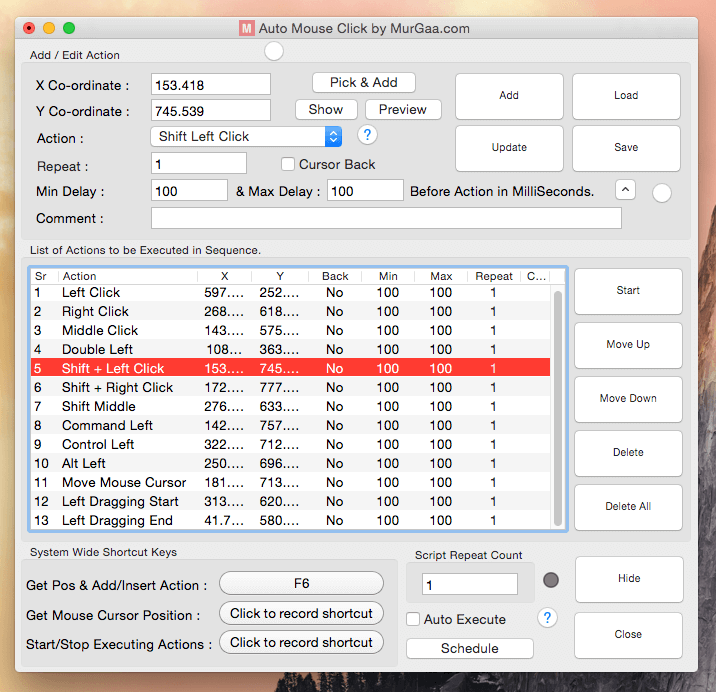 Controlling Automatic Mouse Movements is really easy with this Mouse Moving Application and all features of the software are configurable from a single screen. You can launch the software from the Desktop Shortcut and close it by clicking on the top right close button. Yes you can even configure Automatic Exit for the software by using the Right Click Menu of the Notification Area Icon. 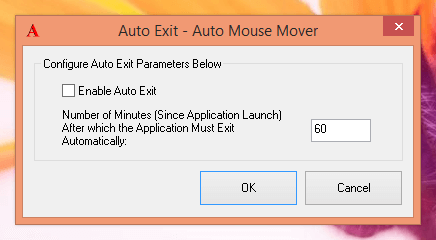 Although this Mouse Moving Software does uses minimal computer resources, and most modern day computers / laptops do have enough cpu and memory resources to keep running small applications in background, you might wish to use the Auto Exit feature of the software as displayed in the screenshot above. Yes you can always look into Task Manager to confirm that this Software does utilizes minimal Computer Resources. Whether you are using a Windows Computer which is a part of Secure Network or a Standalone Workstation, you might be tempted to change the title text of the software and yes that functionality is built right into the software itself. Yes you can even change the Application Icons. When this Mouse Moving Utility is actively preventing Windows from Locking Automatically, the Notification Area Icon turns blue and when the Application is just sitting idle and not Simulating Mouse Movements, the Notification Area Icon of the Utility displays a Red Color Icon. 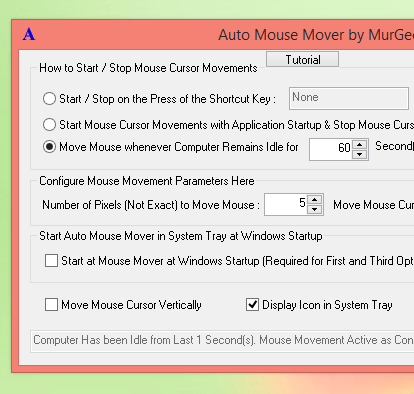 You can yourself change the Active and Idle Icons of the Application from the Main Screen of this Mouse Moving Application itself. Once you have stopped the application, your Windows Computer will work as configured and your Windows Computer will Lock Automatically as configured by Network Administrator or as configured in Windows Control Panel. This Shortcut way of controlling your Windows Computer Activity allows you complete control over your Windows PC. Yes you do need to make sure that when you are not using your Windows Computer, it will not Lock Automatically and it’s your responsibility to make sure that you do understand and take responsibility of that. Download a Video Tutorial to watch how easy and fast it is to control your Windows Computer and yes it does not requires any Installation and neither it needs Admin Rights. Alternatively you can download the software right now and give it a try yourself for Free. The Application saves it’s settings automatically so all you need to do is launch the software from either a folder on your hard disk or even from a USB Drive and whenever you want, keep your Windows Computer Active as if you are actually using it. 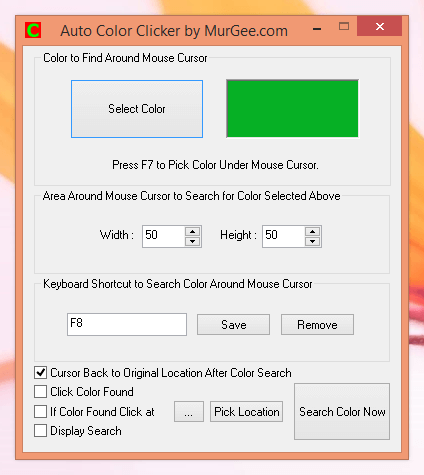 Find Color around Mouse Cursor and Click at Color found with Fast Color Clicker. 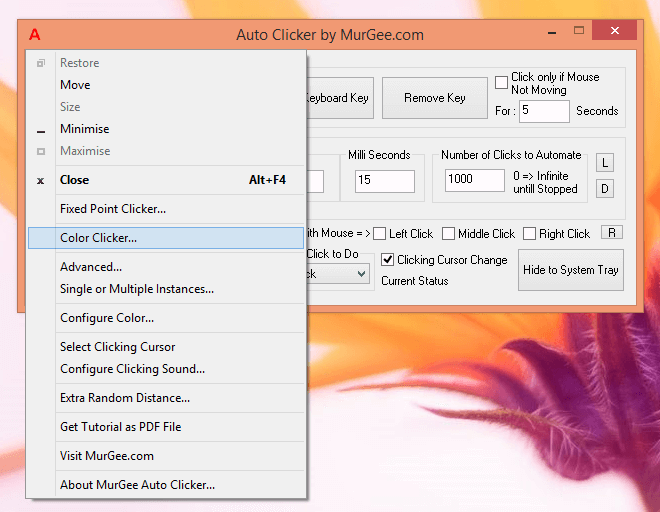 This functionality is present in MurGee Auto Clicker and this post displays screenshots and video tutorial showing how you can launch the Fast Color Clicker and find specific color and simulate Mouse Click. Given below screenshot displays the main screen of the software with 1 pre-configured keyboard shortcut key to pick screen color. Another Keyboard Shortcut allows you to start the search for color around current Mouse Cursor location. Note in the above screenshot that there are few configurable options allowing you whether to click the color found or click at a different screen location if color is found. Yes you can easily pick screen location to click if color is found. The check-box Display Search Allows you to visually see the Color Search being performed by the Auto Clicker. The Color Search is really Fast when the check-box Display Search is unchecked. Note that the Color Search is performed by this Fast Color Clicker around current Mouse cursor Location. In case you would like to have the Color Finding and Clicking in a Macro Script, do use the Auto Mouse Clicker which is a Macro Software with Color Search and Clicking functionality. The above screenshot displays how you can launch the fast Color Clicker from the System menu of Auto Clicker. 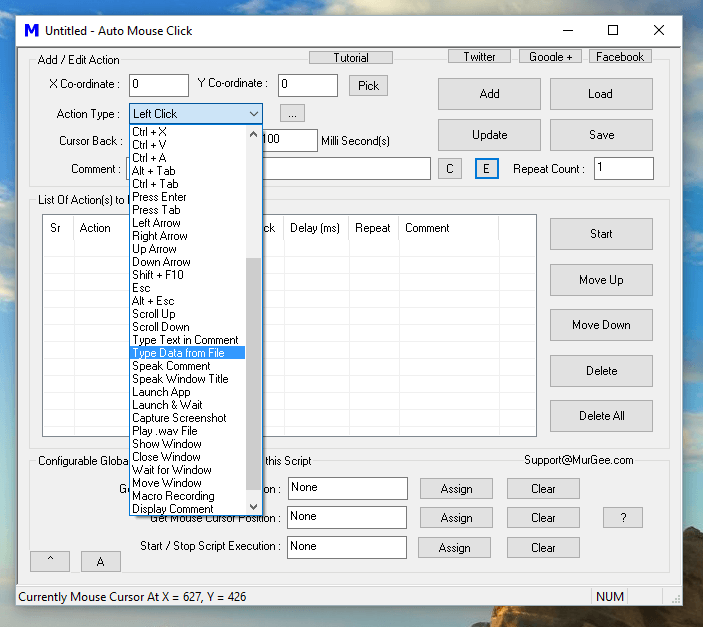 There are lots of other Mouse Clicking features offered by the Auto Clicker which can be really useful when playing online Games or whenever you want to use your Keyboard to do the Mouse Clicking for you. Note that doing a Mouse Click once the searched Color is found around Mouse Cursor is optional and yes you can define the Screen Area around Mouse Cursor to be Searched for the selected color by defining a virtual rectangular area dimensions in pixels. 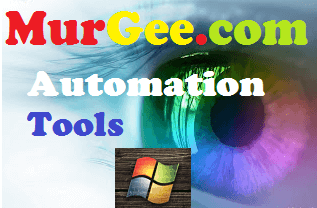 Download Auto Clicker and use the Color Matching and Clicking functionality offered by this Windows Automation Utility on your Windows 8.1, Windows 8, Windows 7, Windows Vista Windows 2000 or even on Windows XP Operating Systems. 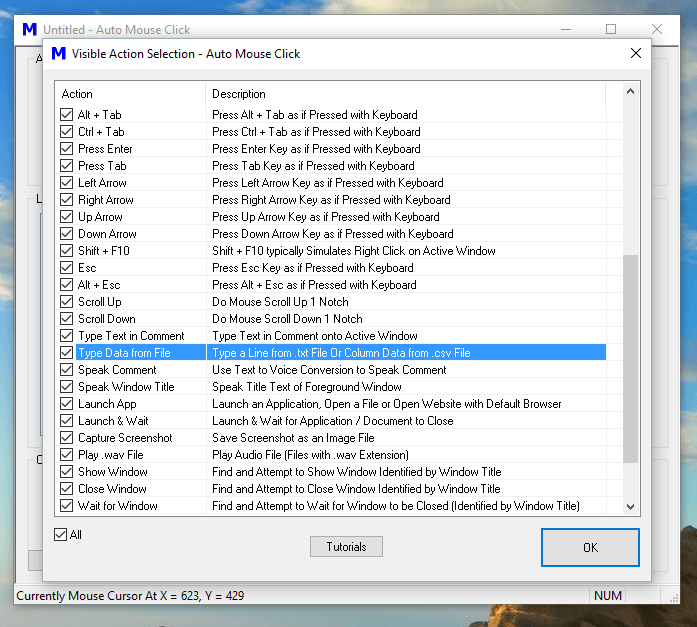 You can also Watch a Video Tutorial in your own Media Player which displays how to Launch the Fast Color Clicker and then use it to find color around Mouse Cursor. The Color Search algorithm has been designed so that it does quickly searches the color around mouse cursor. Just remember that the smaller the area you give the Fast Color Clicker to search, the Faster it will find the Color and yes if configured, it will do a Mouse Click (at either Found Color Location or pre-defined Fixed Screen Location as configured) once the Color is found.